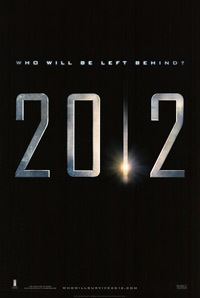 Roland Emmerich's 2012 is a hold-onto-your-seat end-of-the-world disaster movie that does not take itself too seriously. 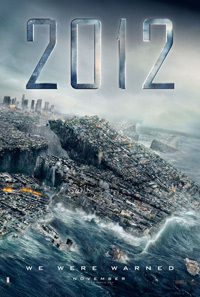 Based on several 2012 prophesies with emphasis on that of the the Mayan calendar, the plot is weaved around two central characters: Geologist Adrian Helmsley (Chiwetel Ejiofor) and author Jackson Curtis (John Cusack). Helmsley, with the assistance of a colleague Dr Satnum Tsurutani, discovers that the core of our planet is being heated by solar flairs and that this event will cause earth crust displacement. Along with all the major governments of the world, they have two years to prepare for "the end of the world"
The heads of state have a plan to save a select section of the population, and to keep the rest of the world in the dark. This plot is discovered by Curtis when he takes his children to the Yellowstone National Park where he makes an interesting discovery and also meets conspiracy theorist Charlie Frost (Woody Harrelson). And so starts Curtis's epic journey to save his ex wife, her boyfriend (who incidentally is an amateur pilot) and his two kids. Their journey takes them to China where both Curtis and Helmsey realize that it is only the super rich that is to be saved, this creates a moral dilemma for Helmsley and a very tense finale unfolds. 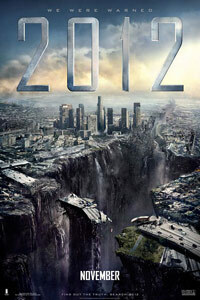 Even if you are not a fan of disaster movies you will be entertained by 2012. 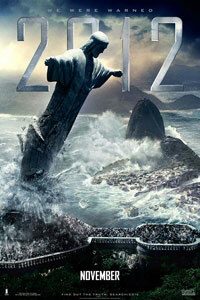 Roland Emmerich has outdone himself with the sheer scale of destruction that paints a very bleak picture. If you are a serious conspiracy theorist you will find lost of holes in the plot and 2012 will probably not live up to your expectation. If you have a planet to destroy (or at least a major city), Roland Emmerich should definitely be in your top 3 list as the man for the job. Geologists discover that the world is heading for a global catastrophe (which may be linked in with the Mayan calendar which ends in 2012). As with Emmerich's Day After Tomorrow, the experts approach the government who write it off as bogus - until it hits the fan and quick plans have to made to save (at least part) of the world's population. A struggling writer who has a strained relationship with his kids (after divorcing), becomes the human focal point of the story when he takes them to Yellowstone for a bonding experience doing some (failed) camping. Here the magnitude of the situation becomes clear and a dizzying race for survival kicks off. Cusack is again the everyman-neutral-guy and succeeds, while Amanda Peet as his ex-wife often fall into dismal acting territory. You have cliché Russians and Indians, and Danny Glover as the US president is touch and go. The hopelessly overplayed conspiracy theorist caricature of Woody Harrelson is rather disappointing in its hammed-up stupidity, but will appeal to the general audience. While they try to milk your sympathies and emotions focusing on this group of individuals amid the chaos, in the end it is the amazing, big budget digital effects that is the star of the movie. The movie's highlighting of humanity's ability to be compassionate as well as self-serving is illustrated in the most basic of ways for a general audience to leave with a bit of a message and not just a get their hair blown back by a visual extravaganza. PS. South Africans (and Capetonians in particular) will get a kick out of a small but highly crucial piece towards the end.